Can I Export My Posts As A CSV? We offer future post exporting on a case-by-case basis. If you need to export future Queued posts, please contact us. 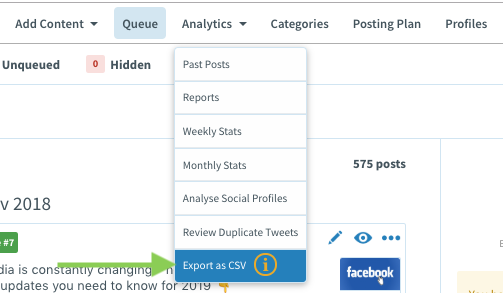 For plans with Advanced Analytics, you can export your past posts as a CSV from the Analytics menu. If you are curious about what your plan entails or if you need further support, please contact Customer Success.